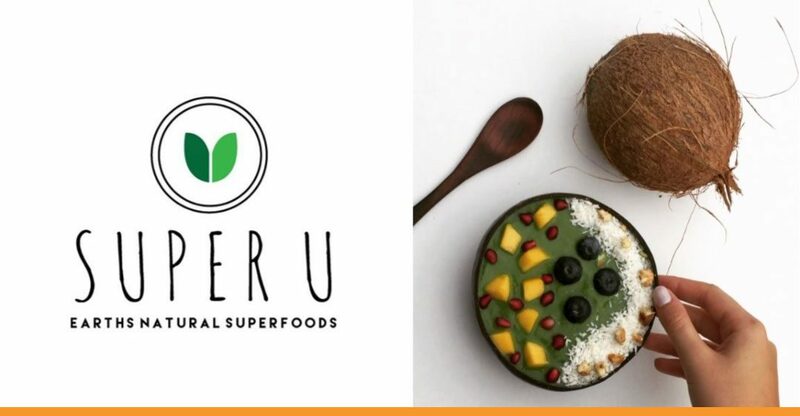 Nottingham Trent University graduates Charlotte Bailey and Sean Ali came up with the idea for Super U, blended superfood supplements, after both suffering ill-health in the final year of their studies. New to the world of entrepreneurship, they sought help and advice from NBV. Charlotte tells us more about their start-up journey. My partner Sean and I have developed a health foods business called Super U which specializes in highly nutritious superfood supplements to incorporate into your daily diet. We are currently based in Nottingham, after recently graduating from Nottingham Trent University this summer. We wanted to create Super U, due to our personal connection and understanding of the problems that occur when suffering with an internal condition such as Coeliac Disease and IBS. I suffer with Coeliac Disease and struggle with many reoccurring problems that are associated with the condition. We were seriously running out of alternatives to help fight fatigue and poor immune health and whilst studying at University, these really did create many problems. As we have both always appreciated natural and healthy food in our diets, it led us to research the power of superfoods and how they could potentially benefit our overall health and wellbeing. We began experimenting with a number of different superfoods, from which I experienced many benefits. This got us really excited as we noticed a gap in the market for superfood blends, which incorporate many of the best superfoods on the planet. We currently have three superfood blends developed with our supplier and have just finalized our branding and packaging. As a brand we value the most natural and nutritious food given to us by our amazing planet. In return, we strive to contribute to a more sustainable world. Our passion is for us all to love and appreciate the power of Superfoods. What attracted you to work with NBV? We came across an NBV leaflet in the Nottingham City Centre Job Centre. As we are both new to the world of Entrepreneurship, we were seeking as much help as we could get to make sure we were on the right path. NBV seemed like the perfect fit! We contacted NBV mentor Richard Crowden, and we had a meeting with him a few days later. He invited us to join a 2-day course provided by NBV called ‘Understanding Enterprise’, where we would be awarded a qualification once completed. We found this experience very helpful and enjoyable! This led us to being put in contact with our current mentor, David Hallam, who we have regular meetings with to monitor our progress and the development of our business plan. How has the mentoring support provided by NBV been of help to you? The support we have had so far from David has been outstanding. He has really helped us understand what we need to do to get to where we want to be in a structured and organized way. He has put us in contact with a number of people from whom we shall benefit, during our development stages and for the future. He has explained the importance of planning, especially the cash-flow forecast, in order to see whether success is achievable and more importantly realistic. He has helped put our ideas down on paper and act upon them, and we are very grateful for his continued support. What are the future plants for Super U, and do you have any tips for other business owners starting down the same path? We intend to launch our business in October of this year. We have had a few setbacks, as originally we hoped to launch at the end of August/ start of September. This has been quite stressful for us, as things can often move a lot slower than you hoped. But we can start to see the end of this journey now and once we have launched, we will be very happy! The best advice I could give, is to never give up! We have both learnt that starting your own business is not easy and most of the time things will not go as planned. But it is all part of learning how to be a successful Entrepreneur and nothing in life is ever simple! We just have to remain positive, as positivity in life is key if you want to achieve your dreams.